Citation: Ann. Mag. Nat. Hist., ser. 6, 7: 304. Type Locality: "Northern Somali-land"; according to the collector Clarke (in Sclater and Thomas, 1898:220), "about three hours from 'Bairwell' or about one day from 'Buroa Well, Habergerhagi's country'" (N Somalia, vicinity of Burao and Ber). Distribution: E Ethiopia and N Somalia. 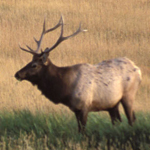 Status: U.S. ESA – Endangered; IUCN – Vulnerable. Comments: Reviewed by Schomber (1964). Sometimes placed in a separate tribe, Ammodorcadini (e.g. Eastet al., 1999), the correct form of "Ammodorcini".